I just received my Mooshimeter from a kickstarter that I backed a while ago. 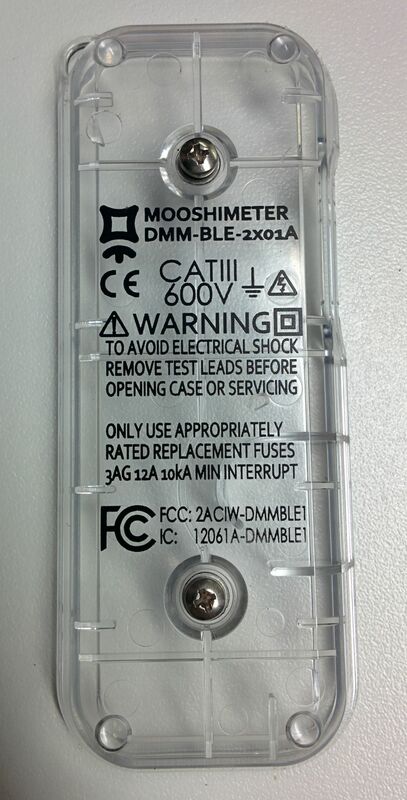 The Mooshimeter is a small battery powered multimeter that talks to your smartphone or iPad over Bluetooth LE. Not all devices have BLE so you should check before jumping to buy this. The bluetooth IC is the CC2540 which is an integrated MCU + bluetooth system. The analog front-end is the ADS1292 dual 24-bit delta-sigma converter. As far as delta-sigma goes, it seems to be a very nice part with a maximum sample rate of 8kHz. 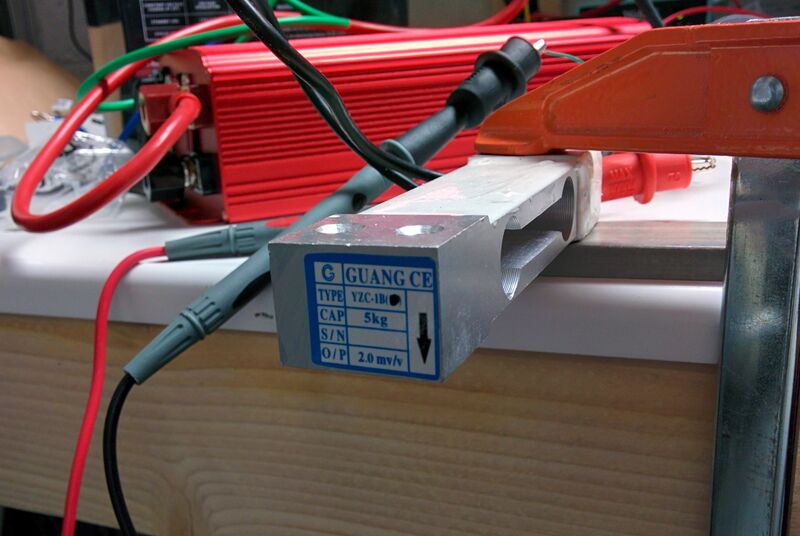 The load cell is a super inexpensive (cheap) beam cell that I bought on Amazon for about $25. A load cell uses a resistive bridge strain gauge to measure the small amount of deflection in a calibrated beam. The deflection follows the strain linearly. Using this relationship you can use a load cell to measure force such as gravity. 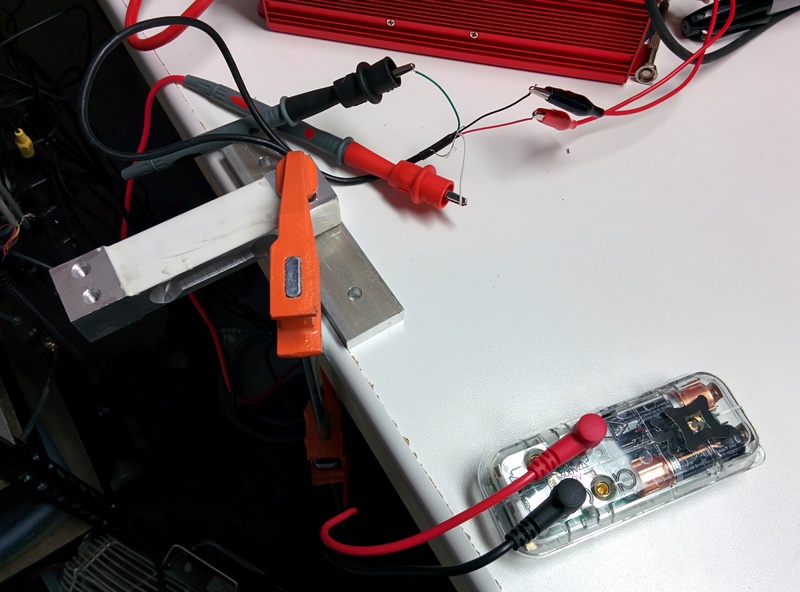 This means if the input is 10 volts (typical maximum) the output of this particular load cell will be 20 millivolts when a force of 5kg (49 Newtons) is applied. This is a difficult value to measure with a multimeter. The Mooshimeter claims 24 bit resolution which should give us plenty of bits even with this small maximum scale of 20 mV. 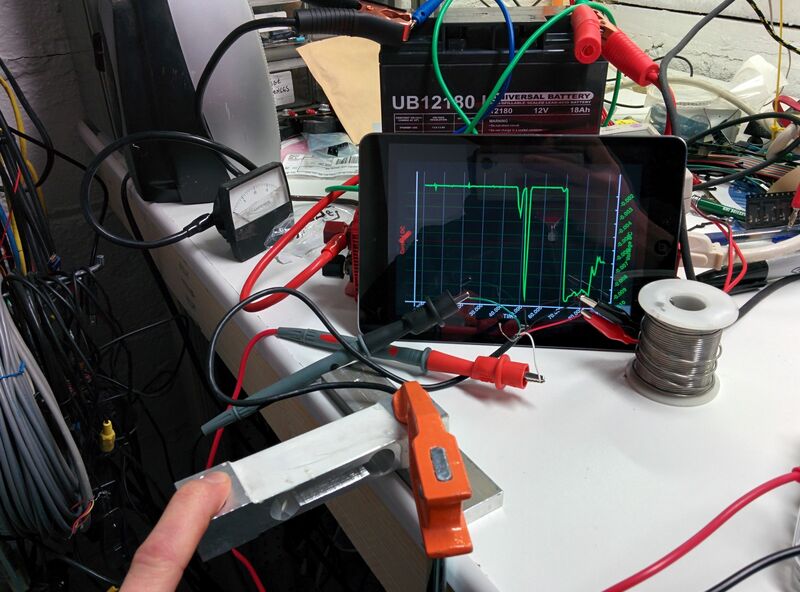 I hooked up the strain gauge and measured 1.43 mV. This value is a combination of the gravity pulling on the load cell (aka the weight of the load cell) and mismatch in the strain gauge. I didn’t pay much for this load cell so I suppose I can’t expect great performance. If we subtract the values, the solder weighs 1.22 millivolts. Previously we calculated that the full scale of 5 kg (49 Newtons) is 20 millivolts. So according to my load cell and Mooshimeter, my roll of solder weighs 1.22mV/20mV * 49 N = 2.99 N. This is 0.67 pounds. That sounds pretty good to me. My cheap OXO food scale says 0.675 pounds which corresponds surprisingly well! 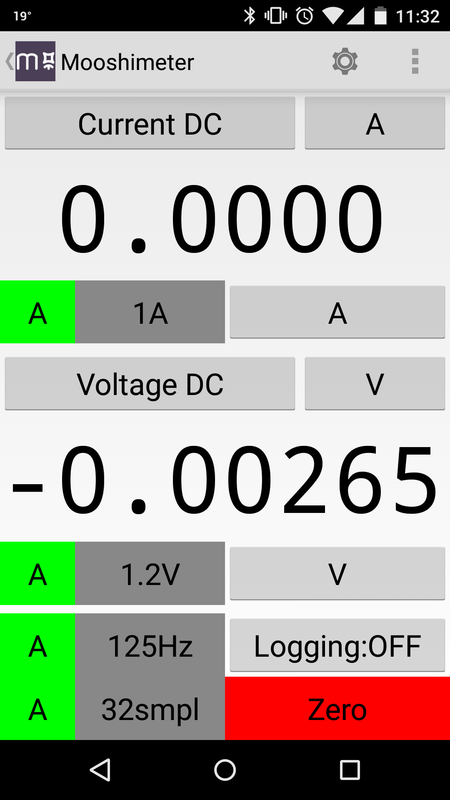 The Mooshimeter app will show a graph vs. time of voltage (and current) I made a short video of me pushing on the load cell with my finger to demonstrate this. I haven’t had a lot of time to play with the Mooshimeter but I think it will definitely show it’s usefulness as time goes by. Of particular interest to me will be long-term data logging which at the time of this writing is a feature that has not been finished. Just FYI – for very low voltage measurements like you’re doing (+- 1V) you’ll get much better resolution and better SNR using the port labeled Ω. 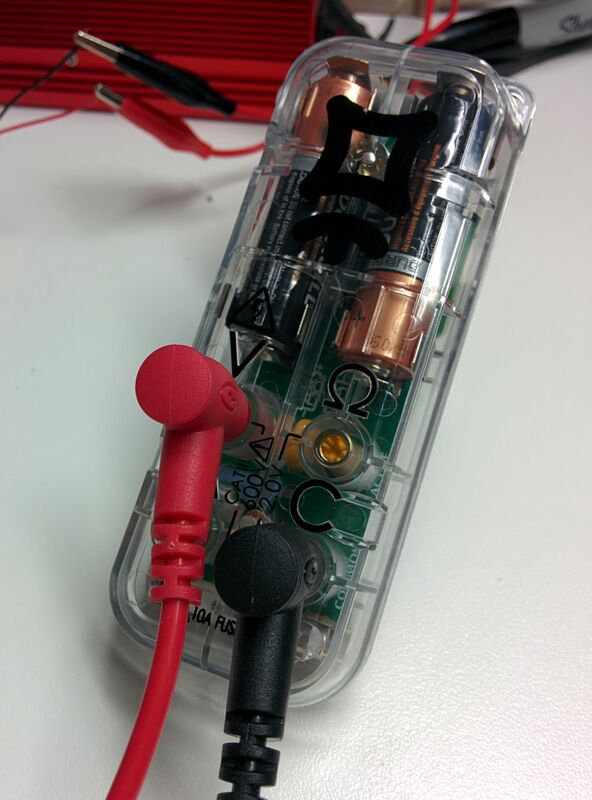 The reason is that the Ω port doesn’t go through a voltage divider like the high voltage input. Sorry there’s not manual for the app yet, working on it. If you tap the label in the top right saying “A” that will switch channel 1 to measuring the omega input, which should default to voltage DC. Yes I await a manual and some more features but I’m very happy to have received the hardware. I hope to see the Mooshimeter take off. I recently designed a wireless system using CC2540 and ADS1292, but I cannot read the right datas from ADS1292, Can you share me part of your code about how to communicate with CC2540 and ADS1292 ? Sorry George, I didn’t make the mooshimeter I was just writing about it. The folks on the TI forums are generally really helpful. I suggest you check that out.